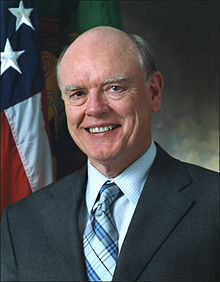 John William Snow (born August 2, 1939, in Toledo, Ohio) served as the 73rd United States Secretary of the Treasury. 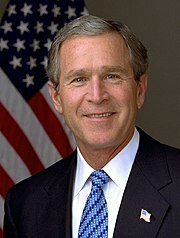 He replaced Secretary Paul O'Neill on February 3, 2003 and was succeeded by Henry Paulson on July 3, 2006, in a move that had been anticipated for several weeks. Snow submitted a letter of resignation on May 30, 2006, effective "after an orderly transition period for my successor." To replace him, U.S. President George W. Bush nominated Henry M. Paulson, Jr.. Snow announced on Thursday, June 29, 2006 that he had completed his last day on the job; Robert Kimmitt served as acting secretary until Paulson was sworn in. ↑ "Lincolntribune – Der Broker Profi vom Dienst". ↑ Robb, Greg. "Snow mulling leaving Treasury post: report". MarketWatch.